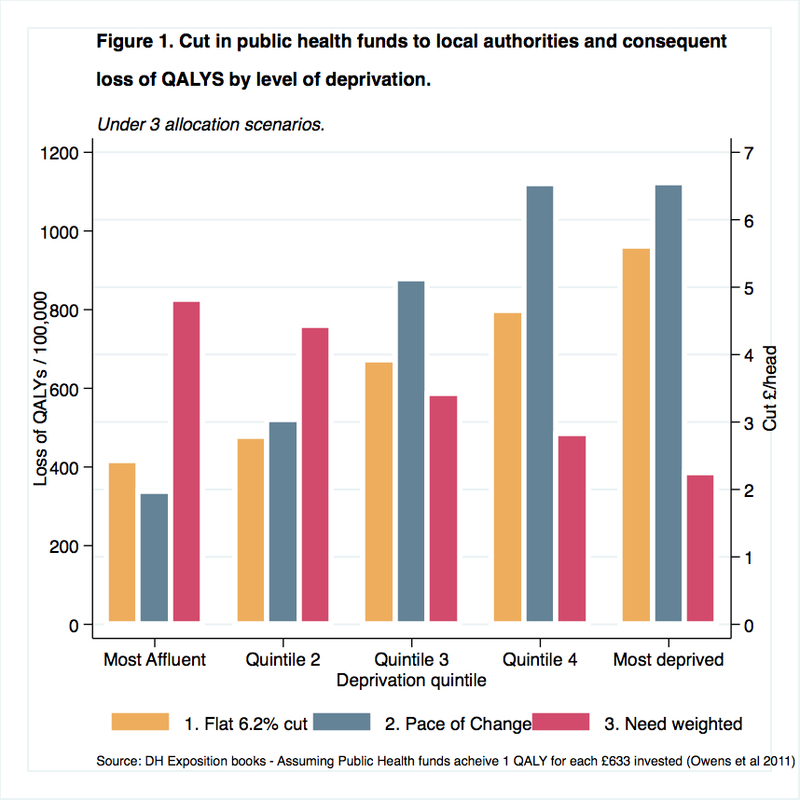 Cutting public health funds – implications for health inequalities? Yet his announcement of a £200 million cut in public health funding, contradicts that statement and puts the NHS plan at risk. This 6.2% reduction in the public health budget will have adverse consequences for the health and wellbeing of the communities served, as well as increasing future demands on the NHS. Many public health services are cost saving, meaning that this action is likely to cost the Treasury much more than £200 million in the long run (1). But will all areas be affected equally? This will depend on where the cuts fall, with the harm caused proportional to the absolute reduction in resources in each area. The £200 million cut is the equivalent to a reduction of just under £4 per person in England. Quality Adjusted Life Year (QALYs) (1) are calculated by estimating the years of life remaining for a patient following a particular treatment or intervention and weighting each year with a quality of life score. A cautious estimate of the cost effectiveness of public health interventions is £633 per QALY gained, which would indicate a potential reduction of 600 QALYs per 100,000 population or 32,000 QALYS in total. Previous austerity measures, in particular cuts to local authority funding, have not been applied equally, but have hit the poorest hardest (2). Public Health England is to consult with local authorities on how these new cuts will be implemented and it remains to be seen where the axe will fall. 3. a needs weighted cut, with the absolute cut in funds in each LA, inversely proportional to the level of need in that local authority. For example, an LA with twice the average level of need, as measured in the PH allocation formula, would receive half the average cut. The effect of these three scenarios is shown for all local authorities, divided into five groups, from the most deprived 20% to the most affluent 20%, both in terms of the absolute cut in resources per head of population and how that translates into QALYs lost, assuming an average cost effectiveness of public health interventions of £633 per QALY. The flat cut and PoC scenarios clearly have the potential to increase health inequalities. A flat 6.2% cut to all local authorities would have a greater adverse impact in poorer parts of the country. Somewhere like Blackpool BC would lose £9 per head of population, whilst Surrey CC would only lose £1.70 per person. A Pace of Change model would have an even greater adverse impact on poorer areas. As more deprived local authorities are more likely to be over target, poorer areas would receive an even greater cut in funding in this scenario. Blackpool BC would lose £19 per head of population, whilst Surrey would lose only 70p per person. This would come on top of larger cuts in core local authority budgets that have already occurred in these areas, with Blackpool BC having lost £225 per head from its core budget since 2010, whilst Surrey CC’s budget has only been reduced by £53 per head (3). There is evidence that each pound of public health investment results in larger health gains in deprived populations (4) and therefore each pound cut may have a even greater adverse impact in more disadvantaged areas. If that were the case this analysis would under-estimate the overall adverse impact of these funding scenarios on health inequalities. The needs weighted option is unlikely to increase health inequalities. In this third scenario, since the level of cut in each LA was weighted by the level of need, the cut is lowest in the deprived local authorities that have the highest needs. In practice any policy that results in a higher absolute cut in resources from poorer areas as compared to more affluent areas is likely to increase health inequalities. Cutting public health funding is likely to damage people’s health, increase demand on the NHS and cost more in the long run. But if these cuts fall hardest on the poorest parts of the country they are also likely to widen health inequalities. We already have some of the largest differences in health between regions, of any country in Europe. These result from and contribute to the massive economic divide between the richest and poorest parts of the country (5). Reducing rather than increasing these inequalities is not only a matter of social justice, but will also be necessary for the government to achieve its aim of rebalancing the economy. PoC policy assumes the minimum cut is set at 3% and the maximum cut rate is set at 15%. The local authorities that are most under target get the minimum cut of 3% and those most over target get the maximum cut of 15%. A number of local authorities who are relatively over target, but not the most over target, receive a cut above 3% but under 15% depending on their position from target relative to all other local authorities. (1) Owen L, Morgan A, Fischer A, Ellis S, Hoy A, Kelly MP. The cost-effectiveness of public health interventions. J Public Health 2012; 34: 37–45. (2) Whitehead M, McInroy, N, Bambra C, et al. Due North Report of the Inquiry on Health Equity in the North. Liverpool: University of Liverpool and the Centre for Economic Strategies, 2014. (3) Local Government Finance Settlement 2014-15 and 2015-16. .
(4) Barr B, Bambra C, Whitehead M. The impact of NHS resource allocation policy on health inequalities in England 2001-11: longitudinal ecological study. BMJ 2014; 348: g3231–g3231. (5) Bambra C, Barr B, Milne E. North and South: addressing the English health divide. J Public Health 2014; 36: 183–6. Just noticed a possible typo in the calculation of total number of QALYs represented by £200mn @ £633 per QALY, which I think should have another zero, i.e. about 320,000 QALYs.